If the United States has historically had more success in integrating its immigrants than Europe does nowadays, it's because the American work ethic makes greater demands on the newcomers than Europe's welfare societies - at the same time that America offers a job-related payback in dignity and the prospect of success. Reading Vinocur's article made me look back at my own childhood. I never once heard my parents blame the American government for not helping us out. They didn't expect it. They were thankful to be here after experiencing the antagonism against Bengali newcomers in London, where they had first tried to settle. Baba, who had been a highly qualified engineer in India, found work as a draftsman for little pay in New York City. We lived in a tiny apartment, and Ma counted our pennies carefully. When my sisters' feet grew, she slit the tops of their shoes to make room for their toes (I always wore hand-me-downs — check out the photo of Ma and me above). 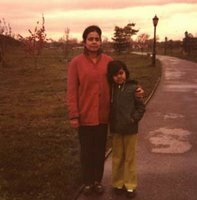 Baba studied hard, passed the American professional engineering examinations, and eventually became the Director of the Port of Richmond in California — quite an achievement for someone who used to be a skinny refugee boy from a Bangladeshi village. So, what do you think? Vinocur admits it's politically incorrect to argue that immigrants do better when they have to rely mostly on themselves to make it in a new world. When my Baba arrived here, he was educated and confident. What about immigrants or refugees who are disenfranchised and illiterate? Can they rise to the challenge of limited government help and adopt the American work ethic, as Vinocour argues? Is it demeaning to suggest that they can't?